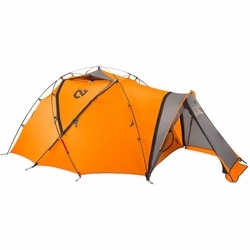 NEMO Moki 3P Tent. The award-winning Moki™ is a bomber expedition tent designed for extreme cold weather, but convertible for milder base camp conditions. Nearly half of Moki’s shell can be converted to mesh by tying back its large doors. Moki Link Connector™ panel allows linking two Mokis together.